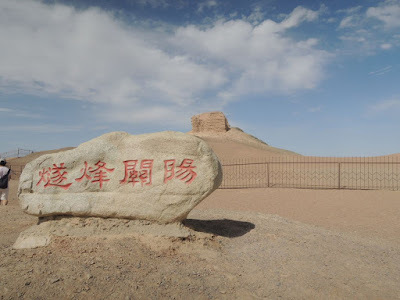 We visited the two westernmost frontiers in China during the Western Han Dynasty in Gansu province near Dunhuang. 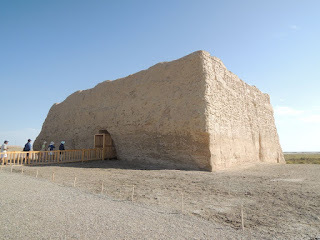 Well, three to four hours' drive from Dunhuang. They were both important points along the Silk Road. Yangguan Pass was built by Emperor Wu in 120 BC and was considered a military lookout post, while Yumen Pass, also known as Jade Gate, was used during the Han Dynasty where people went through here along the Silk Road to get to Central Asia. Yumen Pass had a museum that visitors could go through before heading outside to see the actual structure, a giant brick structure that looked like a fortress that you can walk through. However Yangguan Pass requires a golf cart trip to get to, and then it's surrounded by a fence. Both look like shadows of their former selves... but that's what happens thousands of years later when they fall out of use. Nevertheless, both are points along the Silk Road that should be visited, though driving to get to both points (north and south) was a slog!